Allevyn wound dressings from Smith & Nephew are designed for the care of chronic wounds. They are available in a wide variety of shapes and properties to provide superior healing for wounds. Allevyn dressings are a source of great assistance in the treatment of patients with sensitive or fragile skin. Allevyn wound dressings are a comprehensive range of absorbent foam dressings by Smith & Nephew. The Allevyn dressing range is divided into Allevyn Classic products and Allevyn Life products. Allevyn Classic is a complete range of clinically proven, quality foam dressings designed to fulfill a diverse range of wound care requirements. Allevyn Life is an advanced layered dressing designed to give patients an optimal wound care experience. Allevyn Classic dressings are designed to respond to the human body with a wide range of sizes, shapes and formats. 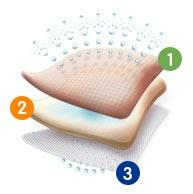 They feature a responsive triple layer technology which creates a moist wound healing environment. This moist environment is conducive to faster wound healing as it keeps the wound at optimal moisture level. Variety of products in the Allevyn foam dressing range means that there is a lot to choose from for different patient needs. There is an Allevyn dressing for every patient; from those requiring a more secure adhesive to those requiring a dressing suitable for use under compression, whether wound is lightly exuding or skin is fragile. Smith and Nephew Allevyn Classic range includes Allevyn Adhesive, Allevyn Non-Adhesive, Allevyn Gentle, Allevyn Gentle Border, Allevyn Gentle Border Lite and Allevyn Ag. Ag option is used when an antimicrobial is needed. Allevyn Adhesive dressing with a secure adhesive is used when security and dressing retention are essential to the user. It features conformability, high absorbency, secure self-adhesion as well as waterproof and bacteria-proof performance. Allevyn Adhesive Foam Dressing conforms to the body contours of the patient to give them a comfortable recovery. Allevyn Non-Adhesive dressing has a non-adherent wound contact layer that makes it ideal for fragile and sensitive skin including epidermolysis bullosa wounds. It is soft, comfortable and conformable to the challenging body areas. Allevyn Gentle dressing has been designed for situations when user needs some gentle adhesion to give a helping hand as he/she applies dressing on delicate areas of the body. The low tack, soft gel adhesive is ideal for use on fragile skin and is proven to minimize trauma and pain at dressing changes. Allevyn Gentle Border dressing is a gentle silicone adhesive dressing for people with particularly sensitive or fragile skin. Soft silicone gel adhesive minimizes trauma to the wound at dressing change, thereby helping to avoid patient pain without compromising care. Allevyn Gentle Border range includes Allevyn Gentle Border, Allevyn Gentle Border Multisite, Allevyn Gentle Border Heel and Allevyn Gentle Border Sacrum. Allevyn Gentle Border Lite dressing is designed for individuals who have light-to-moderately exuding wounds and sensitive or fragile skin. It combines comfortable and conformable thinner foam with the gentleness of a silicone adhesive for minimal pain on removal. Allevyn Ag dressing combines the added antimicrobial activity of silver with the essential qualities of Allevyn Classic range. Allevyn Ag dressing range includes Allevyn Ag Adhesive, Allevyn Ag Non-Adhesive, Allevyn Ag Gentle and Allevyn Ag Gentle Border. 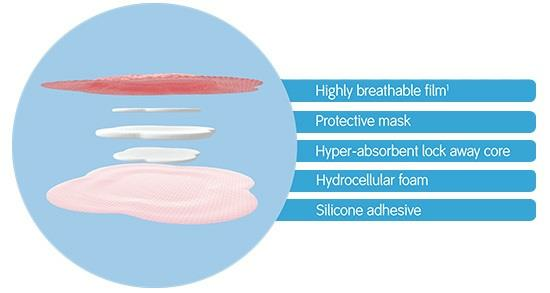 Smith & Nephew Allevyn Classic dressings incorporate a highly absorbent hydrocellular foam pad placed between a highly permeable outer top film and an adhesive perforated wound contact layer. Breathable Top Film: Outer polyurethane top film becomes more breathable in the presence of exudate. It provides an effective barrier to bacteria, minimizes the risk of cross contamination and prevents strikethrough. Highly Absorbent Foam Core: Hydrocellular foam core is highly absorbent and provides an absorption capacity of up to seven days. Non-Adherent Wound Contact Layer: Wound contact layer of Allevyn wound dressings has a low allergy based adhesive which adheres well to the intact skin. It does not stick to the wound and has a proven low risk of skin irritation. Allevyn Life dressings are designed for individuals who happen to be patients. This is the next generation of silicone foam dressings, introduced following a global patient ethnographic study. They have a unique quadrilobe shape designed to fit the difficult contours of the human body. Allevyn Life dressings provide leakage prevention and absorb common wound odor. Cushioning layer of Smith And Nephew dressings offers maximum protection. Change indicator minimizes wastage and optimizes dressing change frequency. They are designed to redistribute pressure and complement the pressure ulcer prevention program. Allevyn Life dressings are also available in other versions: Allevyn Life Sacrum and Allevyn life Heel. Allevyn Life Sacrum dressing has a unique tail specially designed for wounds in the sacral area. It fits around the cleft to help overcome common problems like dressing tenting. Allevyn Life Sacrum has been designed following an observational ethnographic research with those clinicians and patients who have experienced sacral wounds. Allevyn Life Heel dressing comes with a unique design to provide protection to wounds on heel. It is the only heel dressing that does not need secondary retention to provide coverage to the malleolus. Multi-layered design of Allevyn Life Heel provides cushioning and helps spread pressure. Silicone wound contact layer is shown to minimize pain to the patient and trauma to the wound during dressing changes and also allows the dressing to be repositioned. Hyper-absorber lock away core, hydrocellular foam and masking layer help redistribute pressure and can be effectively used as a part of comprehensive pressure ulcer prevention program to prevent pressure ulcers. The masking layer of Allevyn wound dressings also minimizes the visual impact of strikethrough.